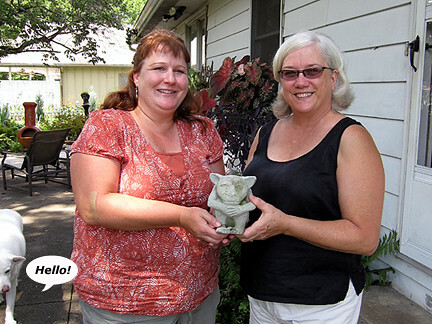 Heading to St Louis in late August, my friend Carole and I stopped in Vincennes, IN to visit Lisa of Greenbow. Here are, from the left, Luna, me, the Greenbow mascot, and Lisa. Lisa has a photo that includes Carole in her entry about the visit. I love all these decorations. The idea of a metal shelf used outside is wonderful. I love the staghorn fern, too. And check out the wonderful windowbox and the flowerpot wreath.Everything is so inviting and colorful. 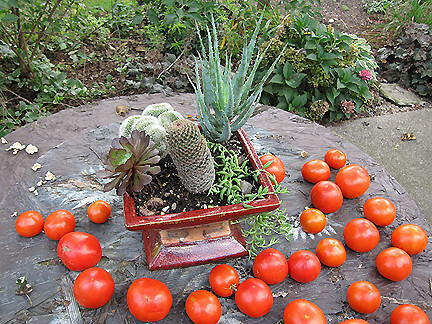 I love how the tomatoes look around this wonderful planter arrangement. 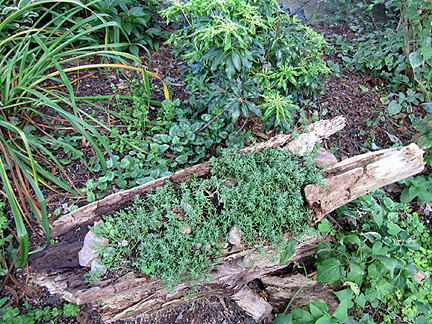 I love the idea of planting groundcovers (in this case, goldmoss sedum and sweet mountain fleabane) in an old tree trunk/bark! This is Lincoln the bear. I mistook him for a hippo, but he didn't hold it against me. 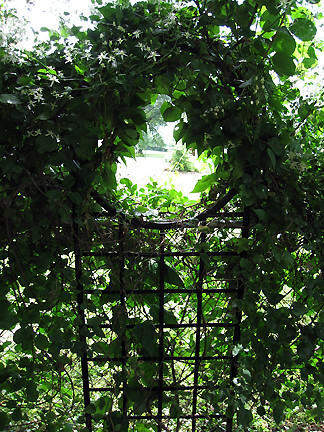 I love this trellis along Lisa's property line. You can almost make out two evergreens on her neighbor's property. I'm sure the circle opening is called a window, but I think of it fondly as a hole. I saw many more holes at MOBOT. I love Lisa's use of old golf clubs as hose guides. I have a very similar obelisk/trellis thingie that I've been moving around and trying different things on, none of which had struck my fancy. Alas, I love hummingbird vine, especially how it covers all the metal work, and will move mine to a sunny location and plant this vine in it next spring. Yay! I was very taken with this fleece flower (Persicaria filiformis 'Lance Corporal') and was actually given (at only mild hinting) three to take away (thanks, Lisa!). I love the spotted leaves and tall delicate pink spikes of flowers. Also note the yellow window on the shed; it's an old wooden-frame window Lisa had been saving to make a cold frame, but finally realized that wasn't going to happen and painted it and hung it on her shed. Brilliant! I, too, have an old window (snatched from someone's trash!) in my own shed, that I admitted this spring was never going to turn into a cold frame... and my shed is vinyl and as boring as can be--what a perfect solution. I think mine will be painted orange or purple! 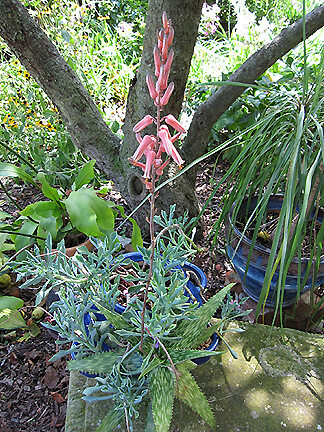 I love the stripey foliage of this aloe, not to mention its great pink flowers. And look how nice that blue-green succulent ties in the blue pot. These type of color combos never dawn on me, and Lisa is very good with them. Not only do I love the greyish purple color of Lisa's shed (it's also the color of my front door), it's pure genius to have mounted this vintage chicken coop on the wall. Look, there's even a chicken in it!! Lisa's garden had much whimsy. I love whimsy but I'm not one for cutesy, and thus have always had a hard time finding accessories for my garden. I was very inspired at Greenbow--Lisa uses a lot of "found" objects that add her personal touch, but they lean to artsy/creative, not cute, and I love that she is re-purposing old things. Luna wants you to notice the subtle interplay of whites and greens in this bed. Note the white edges of hosta, the white bird cage, and grey concrete pot, and, for a limited time only, the wonderful white fluff of Luna herself. 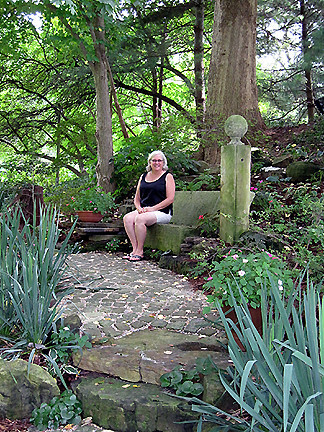 Next, we left Greenbow Gardens and Lisa then took us on a tour of a private garden of a friend of hers and her husband's. The place was incredibly unbelievable, looking more like a small botanical garden than a home garden. Very large space, all fully planted, with many different sections and themes. Here's Lisa in her favorite spot in this garden, the shady bench nook. 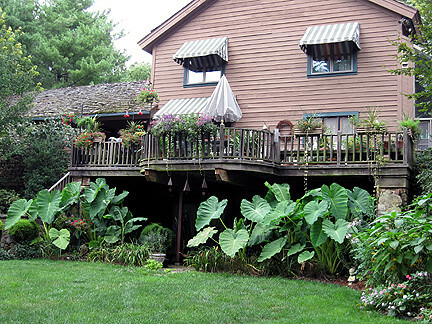 Look how tall the elephant ears are! 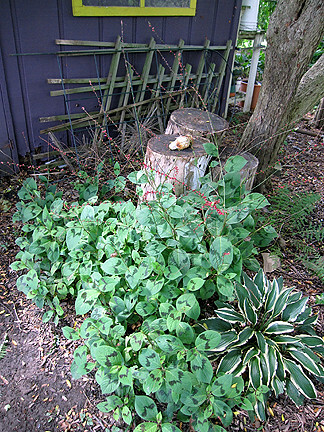 I really felt the impatiens looked like a river or flowing water, but it doesn't come across in the photo so much. I love Nessie (or Asian equivalent) here in the path, which feels like a river. 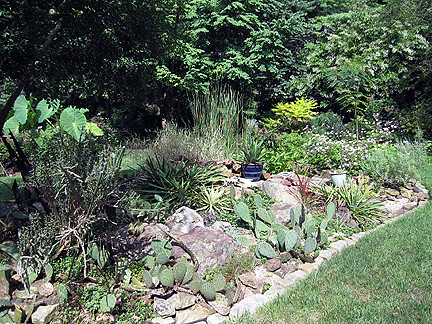 I love the combination of arid and tropical sun lovers in this bed. 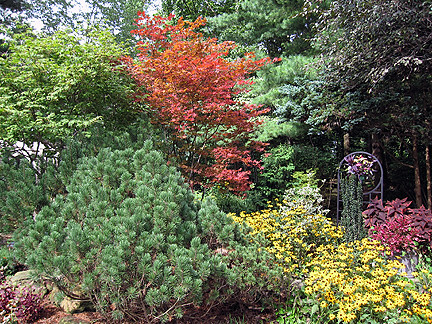 Colorful view when leaving the garden. Lisa took us for a little tour around Vincennes, which is a quaint town. We even crossed a bridge into Illinois (and into the Central time zone!) 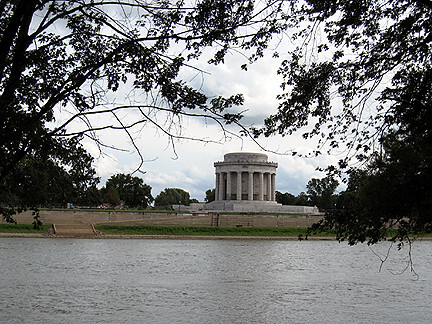 and got a view of the George Rogers Clark Memorial (the largest Memorial Monument west of Washington, DC) in Vincennes from across the river. She also treated us to blueberry tea and the best lemon cookies ever. Thanks for your hospitality and garden inspiration, Lisa! The second garden is beautiful. Looks like a park. Can't imagine the time involved in keeping the garden up. What a great visit you had. :-) I love the impatien-river, too. That impatiens-river is wonderful! Great tour again Monica ... thanks for taking us with you! That is quite a home garden for sure. Just beautiful. I've been to Vincennes because my husband's unit had recruiting duties in that location. A pretty nice area of Indiana for sure. So great you got to visit another blogger! I am so glad you and Carole enjoyed your tours. I throughly enjoyed your visit. Come back any time. I really enjoyed your tour of Lisa's garden. 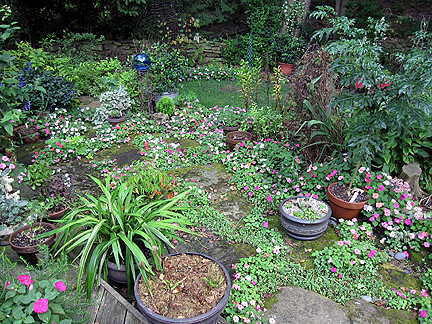 It's lovely, and it's always so eye-opening to see a blogger's garden from another person's point of view. Blueberry tea?? Actually sounds delicious with lemon cookies! Thank you for the tour of Lisa's garden, it's delightful! 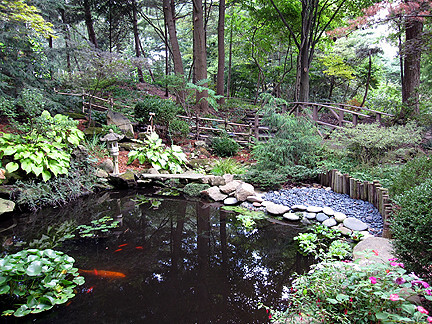 Love the 2nd garden too, especially the river of impatiens. Beautiful! Lisa's garden is amazing. 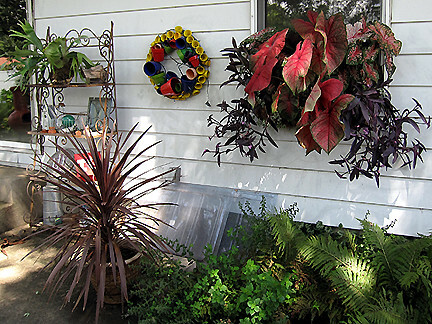 I love the window box with the caladiums. Awesome color combination. Thanks for sharing your visit to Lisa's garden. Fun to see it through someone else's eyes. 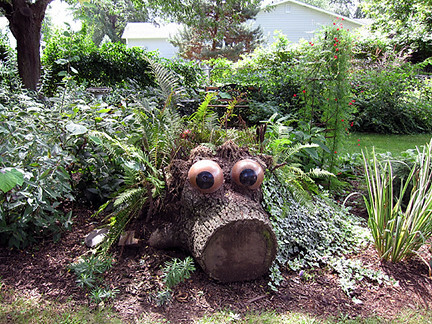 I knew her garden would be fun~~she's a creative and talented artist! I've been eying a birdcage at the antique mall~~this may push me over and into the buying edge! Wow on the second garden! Thank you for reminding us that it was a home garden; I forgot for a minute! The impatien river was beautiful and I really liked the shady nook where Lisa was posing! 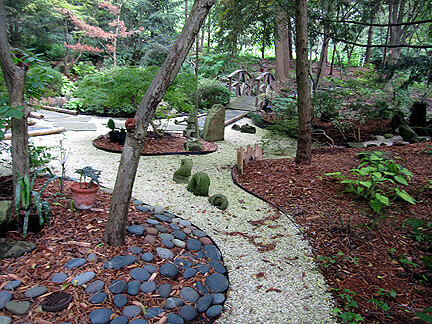 To visit the garden of another garden lover/blogger is a real treat isn't it? 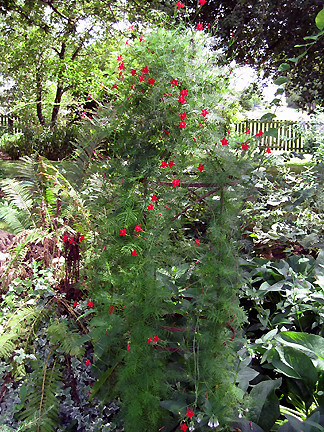 I know how you loved it and it is especially interesting to view one's garden through the lens of a friend. 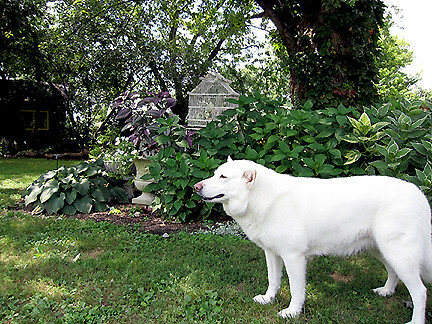 Great shots of Lisa's garden and that of her friend. Luna rules. What stunning gardens! I really enjoyed these tours. 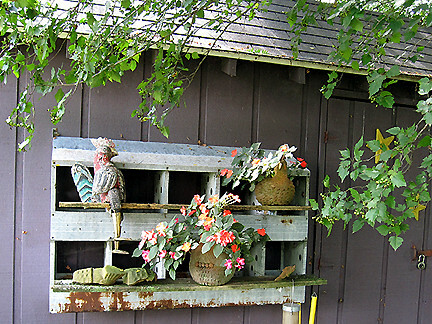 I love the chicken coop and the metal shelves ideas! 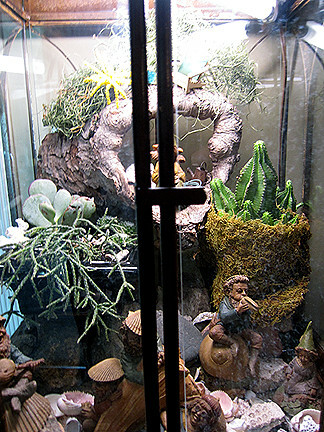 And the faery terrarium! The second garden is, as you say, like a botanic garden - beautiful! Lisa! How wonderful to see you and your breathtaking garden! Monica! How wonderful to see you! Oh my what a tour of Lisa's garden and her home is wonderful! Lots of dreams made in that garden! Thank you for sharing...next year you'll have to head for Canada and take in my garden and them go off to Niagara on the Lake...lots of gardens and B+B's there worth visiting! I love this post and all the beautiful flowers and greenery. I'm a recent follower; when I discovered that you loved Dr Who (your comment on Mr McGregor's Daughters blog), I had to find you. I began watching Dr Who in the 60s in my home province of Newfoundland. I don't believe anyone else in Canada got it. But I was hooked. Then I discovered him again many years later on PBS, beginning with Tom Baker. The new ones are not as good. I will have to ask her for a tour of her friend's garden. How lovely! 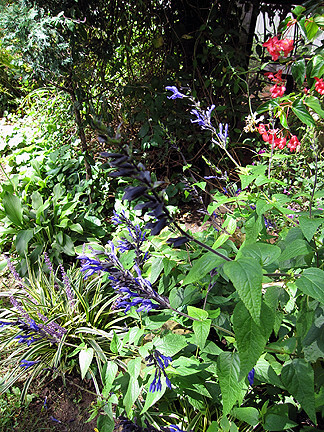 Aw, Lisa's garden is so lush & beautiful. It's fun to see it through your camera, Monica. Everyone looks so happy, including Luna! Sounds as if you had a great visit to Lisa's garden. It looks very special. What a great garden! Very creative. It sounds like you had a great visit. Lisa's garden is really cool. Lots of good ideas. So nice that you and Lisa had a chance to hang out together. What an extremely fun garden tour!! I particularly love the golf clubs used as hose guides. I am definitely trying that!!! Wow, both gardens are amazing! 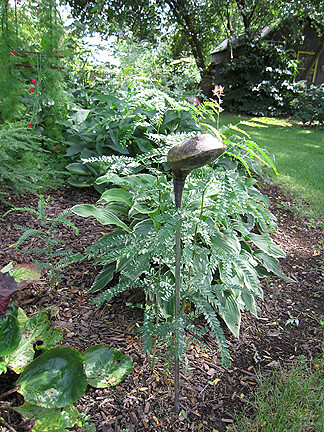 Don't you just LOVE the inspiration you get from other folks' gardens? That's my favorite thing about blogging, too. Very cool.